This compact new Odyssey captures the mojo and sound of the original(s) and the inclusion of all three filters, Drive and MIDI/USB enhances its appeal further. ARP is back! It sounds just like an Odyssey should! Big, bold and beautiful! The inclusion of the three filter revisions plus a Drive circuit make it more versatile than the original models. USB/MIDI is included to help the Odyssey integrate with modern studio/live setups. 'Slimkey' keybed isn't ideal for soloists and serious 'players'. As with the original, it can be fiddly to tune. Approximately a year ago, Korg took us all by surprise announcing the resurrection of one of the most iconic synth brands, ARP Instruments, along with their commitment to build a new version of ARP's most popular synth, the Odyssey. Originally Launched in 1972, the 2800 series (or Odyssey as it became known commercially) was ARP's answer to the hugely successful Minimoog - which appeared two years earlier - and was quickly adopted by many top players, including jazz-funk-fusion gods Herbie Hancock and George Duke. Additionally, the Odyssey's sound was hugely characterful with punchy envelopes, a nice high-mid bump and juicy resonance that allowed it to cut above almost anything (including loud electric guitars), yet it could be smooth and delicate too - such was its versatility. The Odyssey offered lots of sound-sculpting flexibility onboard too, including a lowpass and highpass filter, wide ranging and stable oscillators (each with saw and square waves with fast warm up time), powerful PWM per oscillator, ADSR and AR envelopes (for assigning to VCA or filter), a powerful mixer with digital ring mod and sample and hold, white/pink noise and a single but nicely-routable LFO (Osc1 could also be used as pseudo LFO). Lastly, the Odyssey did away with cumbersome patch cords, which were a hindrance on stage. It's easy to see why it became so popular and we're happy to report that these important attributes are all present in the new 2015 model! We've used several different Odysseys over the years, many of which had seen better days (or didn't work at all!) and we've often thought how great it would be to have brand new Oddy devoid of issues. It seems Korg have answered our prayers! 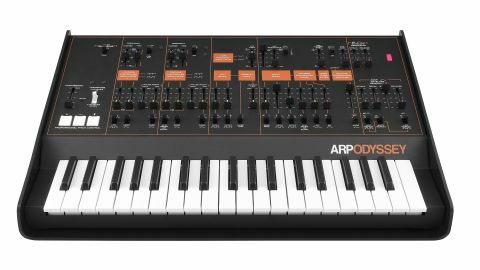 Designed by Korg in collaboration with ex-ARP president David Friend (who designed the original Odyssey with Alan Robert Pearlman and who has written an introductory note included in the documentation), the 2015 Odyssey arrives in a very nice hardshell black case, which carries the ARP logo and contains a foam insert that closely hugs the new Odyssey. This case is certainly tough enough for regular giggers, although it would be advisable to invest in a proper flightcase for more serious touring. The first thing that strikes you is how compact this synth is; it's 14% smaller than the original, just as the MS-20 mini is in comparison with its full-size brother. Unlike the original models, which were pretty deep from back to front and much wider too, the new model easily fits into tighter spaces and takes up less room on your desk, plus it's significantly lighter and more portable which is a great thing for gigging musicians. We're also glad that Korg have eliminated the original Rev 3's fragile overhanging keyboard and returned to a safer recessed design. Although the new model revives the Rev 3 aesthetics, there's also limited numbers of white (Rev 1) and black and gold (Rev 2) models on offer too. All three editions use a single piece of tough, textured black plastic for the sides and chassis, plus a single sheet of textured steel that wraps around to form the front and rear panel. The build quality is solid overall, and the orange and white silk screening looks excellent - in fact everything looks spot on, right down to the font and downsized sliders, though these do exhibit some sidewards play. Since the new Odyssey's announcement, the keybed has been one of the most divisive points of discussion. You'll probably know that it uses the 'Slimkey' keybed from the MS-20 mini and RK100 keytar, which has enabled Korg to keep the aforementioned size and weight down and save on production and shipping costs. However, bearing in mind the Oddy has always been seen as a professional, serious players synth, it does miss a full-size keybed. That said, the Slimkey keybed plays way better than any standard mini-key keyboard (and allows you to span greater distances too) but the smaller keys still make it harder to play more complex bass, melody or solo lines accurately, especially as your fingers tend to slip between keys and hit other notes when moving quickly. The MS-20 mini didn't suffer from this so much, since it's generally used more as an FX or experimental machine, rather than as a soloist's instrument. Studio musicians will likely choose to use the Odyssey over MIDI, triggered from a bigger keyboard (or via a sequencer or DAW) and thus probably won't mind the smaller keybed, but virtuoso keyboardists will always prefer full-size keys. It's certainly worth weighing up whether you prefer a more compact and portable unit with a slightly less playable keyboard, or whether it's worth keeping your fingers crossed for a full-sized version (if the revived MS-20's roadmap is anything to go by). "The sound and character is instantly recognisable and in a blind test you'd be hard pushed to distinguish old from new." On the front panel there are just a few minor changes compared to the original Rev 3. There's a little recessed dip-switch/window next to the transpose switch (set with a pen or sharp object) that allows you to tweak the behaviour of the transpose switch when portamento is engaged. When showing blue, portamento is disabled when switching octaves but when the window is black, the Odyssey will glide between octaves when switched with portamento is engaged. Next, there's a new red power-on LED (and auto power-off to save electricity and the circuitry too). There's also a new switch for flicking between the Rev 1, 2 and 3 filter designs and finally, there's a Drive switch, which boosts the output level significantly and imparts a gritty, yet musically pleasing distortion. Apart from these changes, the front panel is just like the original Rev 3, though everything is of course 14% smaller. Whilst it's great that everything is very authentic to the original, one hangover is that it's still pretty fiddly getting the tuning of the Odyssey exactly in line with other gear without a tuner (the manual recommends using one too). Though the tuning is thankfully super-stable, the Odyssey could do with either an onboard A440hz tuning reference oscillator (like the Minimoog) or a centre detent on the VCO1 'coarse' slider that corresponds to middle C, particularly as you'll probably want to tweak and reset these sliders when performing. As it stands, the midway position on the VCO1 coarse slider is only just off middle C when the Odyssey is warmed up, but it can be a little hard to hit the exact sweet spot due to the sensitivity of the sliders. Around the back there's a solid compliment of connections which help the Odyssey integrate nicely with most studio or live setups. There's CV and Gate In and Out for interfacing with other CV/Gate gear (Volt/Oct standard), Trigger In/Out, a headphone out with dedicated volume control (the sound appears on both sides in headphones) an external audio input that routes audio through the VCFs and VCA (which will produce feedback when fed from the headphone socket, with the headphone volume controlling feedback level), a volume pedal input (that functions as a CV input when using Korg's new SQ-1 sequencer), a MIDI In socket for controlling the Odyssey from a keyboard controller or sequencer (note on/off only, no velocity) and USB for bi-directional MIDI communication with your DAW. Note as there's no multi/legato switch, if you want to trigger the oscillators legato-style, you'll need to run a mini patch cord from the Gate Out to the Trigger In and thus, you won't be able to use the Gate Out or Trigger In sockets for other tasks. Now, on to the all-important sound. The 2015 Oddy is very authentic to the original model(s) and nails all those classic Odyssey sounds. The Rev 3 is the model we've used most over the years, and know its sound well. With the filter in Rev 3 position the sound and character was instantly recognisable and in a blind test you'd be hard pushed to distinguish old from new, except that, as with the new MS-20s, there's a slightly more top end to the new model's sound (perhaps down to improved components/tolerances). The acid test for us was recreating the complex bass sound from Herbie Hancock's Chameleon, and we were able to pull it off exactly using the new Odyssey's Rev 1 filter - something which we've never been able to achieve on any other synth. We were able to source a modified 'white face' Rev 1 Odyssey with the later Rev 3 (4075) filter for the review, and the sound of new model was virtually indistinguishable from the original. So what's the verdict? Firstly, let us massively commend Korg and David Friend for resurrecting ARP and the Odyssey and for nailing the sound of the original, plus going further with some welcome new enhancements. What's great is the Oddy is now even more versatile sonically, and it can easily make subs, screaming or rich leads, dirty noises, snappy drums and FX. Having MIDI and USB connectivity is great too. Do keep in mind though (and not to belittle Korg's efforts in any way) the new Odyssey is around currently £400 more than its MS-20 mini cousin with a street price of around £799, and that the trade off for its authenticity is that it still lacks some important modern, practical features. We dare say some folks would gladly pay more for a modernised Odyssey with full-size keys, integrated power supply, aftertouch, an A440hz panel reference oscillator, a keyboard triggering/mode switch, full MIDI implementation (with syncable LFO and MIDI CC transmission/reception) velocity to amp/filter and patch memory for quick sound storage/recall. Regardless, it's amazing to have a new, reliable and above-all authentic sounding Odyssey in our hands and we're genuinely excited to see where Korg will take the ARP brand going forward.